We all know by now with my million social media posts that I LOVE what I do for a living. And I keep meaning to start a blog, which I will now do, entitled "Why I love..." So many amazing door styles, colors, magazines and e-mails cross my desk. Today, we put together this color palette for a client that I am so thrilled about! Haas Cabinet came out with a bronze color, thought it's more of a deep grey with a hint of green that I absolutely fell in love with. 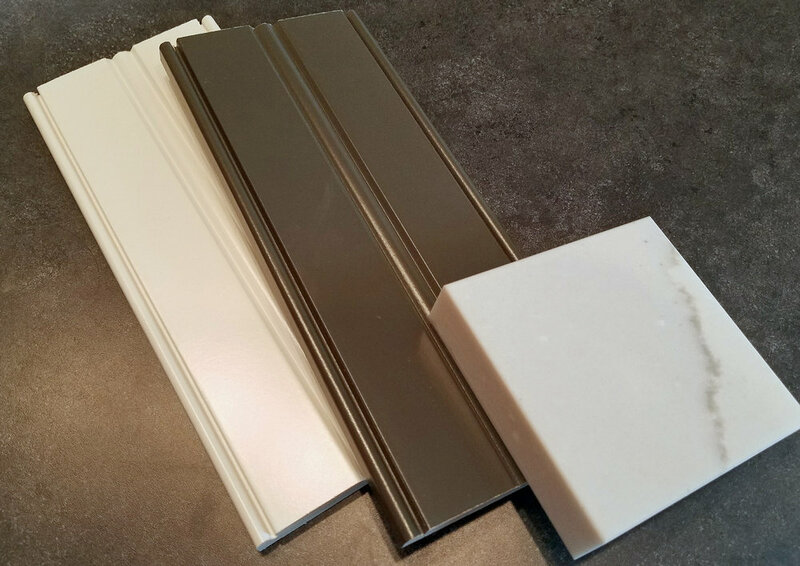 I have no idea which I'm more passionate about...this palette or the Barista Dusk by Cabico's Elmwood Fine Custom Cabinetry. Your thoughts? Doylestown, PA-based Open Door Building Solutions offers stock to fully-custom cabinetry for all residential & commercial uses from top industry manufacturers: Cabico Elmwood, Unique & Essence Cabinetry; Haas Cabinet, Echelon, Fabuwood, & Canyon Creek Cabinets; plus Grothouse wood countertops, the Galley Workstation, Trex Outdoor Storage & NatureKast Weatherproof Cabinetry, and everything you need for cabinet hardware & organization. Our award-winning personalized service means that our commitment to your satisfaction is among the highest in our industry! Call 267-228-5494 or e-mail us soon to discuss your project. Always Wanted an Outdoor Kitchen with FREE Decorative Hardware? Have you ever seen the iMOVE? No more step stool needed!